It’s time to look at a survival film. These are fairly hard to do. There are the easy ones where it’s a group of people stuck on an island inhabited by giant monsters or an enemy clan. Those can work because you’ve got a lot of dynamics at play. Then you’ve got a survival film like this one which is tricky because there is only one character on the island. As a result you run the risk of the film just being boring and unfortunately…that’s exactly what happens here. There is some spoilers for the ending of the movie below so you have been warned. The film starts off pretty strong as we meet Chuck and see that he is a pretty fierce FedEx mail guy. He is pretty obsessed with his company being able to meet deadlines and wants them to achieve more. His advice seems to be working and so Chuck gets ready to make one last delivery/meeting before going back home for New Year’s Eve. Unfortunately the plane he is on crashes and now he is stuck on an island. He’ll have to try and survive for a long while as there is no way to get off this island and people may not find him for a long while. Can Chuck pull this off? The film has a good beginning and an interesting ending. The problem here is the middle. As soon as the plane went down the movie basically went right along with it. There’s just not much to see or enjoy about Chuck’s isolated vacation on the island. There’s no one for him to talk to and not a whole lot for him to do either. As this is the bulk of the movie you can see how it gets old fast. It’s basically all of the usual survival tropes. He tries to make a fire, tries to make a boat, etc. Each attempt injures him further which makes all of his activities a lot harder than they would be otherwise. His attempts are pretty good for the most part and he’s definitely a creative guy so he is able to make things work out. You can respect that from his character, but again it doesn’t make for interesting viewing. I’ll give the movie credit for not being nearly as gross as a recent film where a girl is stranded on a rock with a shark nearby, but it still does do some iffy things like having a crab get stabbed and eating raw fish. These scenes did the film no favor. It takes what could have been an easy 7/10 film and drops it a few stars until it’s under the baseline. If you want to do a survival film, you’ve got to have at least 2 characters. Yeah, you run the risk of adding romance to the movie but at least you can have some dialogue and maybe even throw some humor into the mix. With just one person there is no chance of that and it’s pretty much a waste for Tom Hanks since dialogue is his strong suit. As I mentioned, the beginning of the film is pretty solid. It establishes Chuck as a pretty likable character. It’s a charismatic opening and the film has a lot of fun with the scenes. The writing is solid and a whole film could have been made about Chuck making the delivery times faster. Then once he gets off the island it’s like the film finally restarts. Of course now it isn’t quite as fun since everyone moved on without Chuck. His fiancee is gone and it’s like he has to start life over from scratch. At least he kept his job, losing that would have probably made the ending a little too grim. It speaks well to the company as FedEx just looks really good here. They even throw him a nice party and while part of that is for the PR, the guys in the office just seem like a lot of fun. The movie does drop the ball with the climax though. As mentioned, the fiancee is with some other guy now and at first the movie is pretty tame here as Chuck accepts this and calmly tells her goodbye and wishes her well. Then she runs out of the house and cheats on her current husband one last (presumably) time. I think that scene didn’t need to be in the movie. She made her choice and now she needs to live with it. She makes it pretty clear that the new guy is just a rebound, but that doesn’t make the situation any better. Also, the fact that the other guy used to know Chuck just makes it worse. The fiancee moved on pretty quick after all since she already has a kid and it’s only been 4 years so that means she probably waited 2 years max. That’s a fairly quick rebound. At least now Chuck will be able to focus on his job again. He’s definitely a solid employee as he gets right back into the field. The ending shows that he now has a passion for the work again and I expect he’ll be making a lot of deliveries. He also gets to meet the person who indirectly saved his life through the colorful package that he found on the island. I think that person could make for a good friend although I imagine that Chuck won’t be making a rebound anytime soon. 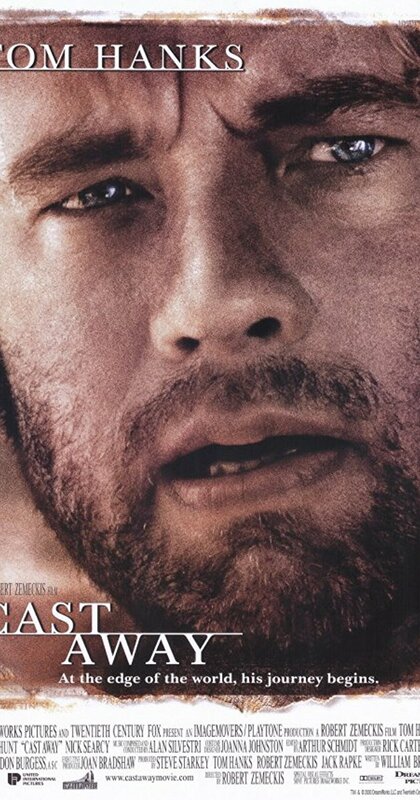 Overall, Cast Away is a film where the actual premise is really what held it back a bit. The characters are fun and all, but it feels like the film hits the pause button early on as we’re stuck on the island for an extremely long amount of time. Cutting part of that time out would have helped the film quite a lot. Being stuck on an island like that just limits the film’s opportunities. If you like films about experiencing nature and such then check this one out. If you’re hoping for a lot of fun dialogue and situations then you’re better off looking elsewhere. This entry was posted in Live Action Movie Reviews, Live Action Movies, Reviews and tagged Drama, Film Review, Island, Movie Review, Nature, Review, Stranded, Survival, Tom Hanks by dreager1. Bookmark the permalink.